Welcome to our Ruby Slots Casino review! Please don’t forget to contribute to the page by sharing your honest experience with other OnlineCasinoBluebook.com readers. You don’t call yourself Ruby Slots without being serious about providing an online slots experience that’s second to none. 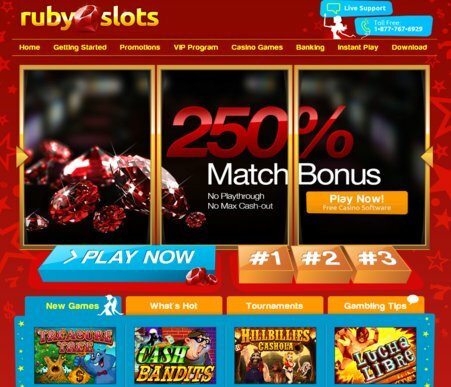 At first glance, Ruby Slots delivers over 130 online slot machine games to tempt even the most discerning slots player. A relative newcomer, Ruby Slots is powered by Realtime Gaming, one of the world’s foremost online slots developers. By partnering with the online software powerhouse, Ruby Slots is able to offer players a slots collection that rivals what you’d find in Vegas. The online casino boasts several different varieties of online slots including 3-reel classic games with one payline, 5-reel slot games with paylines as high as 50, specialty slots with soaring jackpots, and exciting slot games with bonus rounds around every corner. What really sets Ruby Slots apart from the competition and worth trying is that they offer bonuses up to 250% which any player can use at anytime. Another great feature is the free play mode. While countless online slots sites require you to create an account to play free online slots, Ruby Slots lets you play for free – without forcing you to sign up. Just click the Instant Play button on the homepage, navigate to the Slots tab, click the slot machine you want to play, and select Practice. Your free game will load and you can play from your web browser, without having to log in. They offer great online support 24/7, all year round, which makes the overall online slot playing experience nicer and easier for the inexperienced player. You have two choices for customer services: phone support, as well as specially trained Live Chat agents ready to guide you through any issue you may have while you play with their extensive variety of games. The only downside is that Ruby Slots limits the game choices to about three dozen. Still, we think that’s fairly generous considering you don’t have to sign up to play if you don’t want to. This option really makes it easier for the occasional player to enjoy and play plenty of casino games for free. Of course, the online casino also offers a complete casino app, which includes its full online slots games suite. You can check out all the available games at RubySlots.com. For slots lovers, it’s a real gem. Thank you for reading our Ruby Slots Casino review!